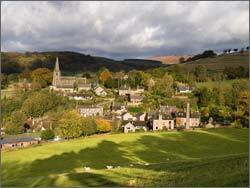 Derbyshire Dales residents have been reminded that Christmas and New Year bank holidays mean bin collections for most residents will be one day later than usual over the festive fortnight. The only exception is the Tuesday collection scheduled for Christmas Day itself, which will take place three days earlier on Saturday 22 December. As Christmas Day falls on a Tuesday this year, it means the week leading up to Christmas – including Christmas Eve – will be business as usual, apart from the additional Saturday collection for usual Tuesday households on the 22nd. 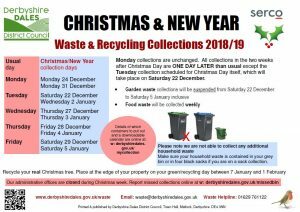 The District Council’s contractor Serco will not be working Boxing Day but will collect usual Wednesday waste and recycling on Thursday 27 December, working extra days on Saturdays 22 and 29 December and 5 January. Residents are asked to note that no additional household waste will be collected, so are advised to make sure all their household waste is contained in their grey bin with the lid shut, or, for homes on a sack collection, in four standard sized black sacks.